This program gives a first hand look to the ins and outs of a laboratory. 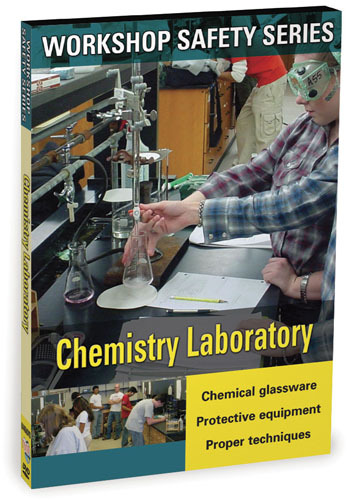 From Fume Hoods to Personal Protective Equipment, this program is a must see for students attending a chemistry class for the first time. There are many processes involved in water treatment such as chemicals, pathogens, motors, tolls and equipment. There are many hazardous risks in working around treatment plants. Biological safety is critical to help ensure safe handling of biological material. This program addresses the procedures for proper use, storage, transfer, and disposal of biological materials as well as biological safety practices to minimize the risk of exposure to potentially infectious materials. An integral part of any chemical hygiene plan is chemical fume hood safety. The term �fume hood,� �chemical hood� and �chemical fume hood� are used interchangeably. This program will focus on using the hood safely, limitations of chemical hoods, good laboratory practices and how to confirm that the hood is operating properly. A Laboratory Safety Program is comprised of the Chemical Hygiene Plan, Biological Safety Program and Radiation Safety Program. A Chemical Hygiene Plan sets procedures, equipment, and personal protective equipment (PPE) and work practices. The components of the Plan include basics of training, engineering controls, PPE, and chemical hazards in the laboratory. This program covers a Basic Chemical Hygiene Plan and how you can use the information to stay safe and healthy in a learning environment. The Chemical Hygiene Plan is designed to protect from chemical and physical hazards present in instructional and research laboratories. Engineering controls eliminate or reduce exposure to the chemical or physical hazards through the use or substitution of engineered machinery or equipment. 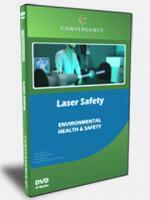 This program explains the Chemical Hygiene Plan that contains laboratory work practices. Use this computer-based training module to learn about working safely around Light Amplification by Stimulated Emission of Radiation (LASERs). This training program is focused on the correct handling and management of hazardous wastes generated at labs and research facilities. Formaldehyde Safety In The University Laboratory - Your university�s Laboratory Safety Program is comprised of the Chemical Hygiene Program, Biological Safety Plan, and Radiation Safety Plan and possibly other topics. Practice always makes perfect. Through this program, seasoned laboratory employees can review safety techniques and general procedures they may have forgotten since their initial training. 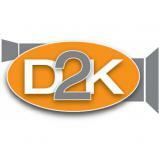 The Hazcom deluxe safety training package includes 19 videos and a CD-Rom of written materials. Chemical spills in the laboratory are serious events that can be hazardous to your health and to the environment. Keeping the lab uncluttered, properly transporting and storing chemicals, and careful planning of experiments can reduce the risk of having a chemical spill. This program covers the procedures for cleaning up chemical spills and protocols to follow. 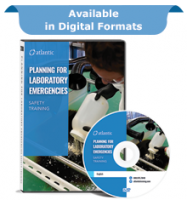 Laboratory Emergencies training video discusses how to minimize damage and prevent injuries if a laboratory emergency should occur. The Safety for Healthcare Workers Library consists of dozens of courses with everything you need to increase awareness of general safety practices and achieve compliance with the national OSHA and state workplace safety rules and regulations in the healthcare workplace.